UPDATE: Full, rated results now posted at NWSRS. The Metzger Winter Classic was the first OSCF Championship Qualifier hosted in the School’s history. The tournament brought in players from near and far. Over 90 players represented the regions of Salem, Aumsville, Albany, Corvallis, Portland, Tigard, Lake Oswego, Tualatin, Sherwood, Beaverton & Newberg. Overall it was a fantastic event that brought some great learning opportunities to help prepare the players for Seaside. As the players arrived they were greeted with a pack of Smarties to help fuel their brains for actions. Five divisions battled it out for some unprecedented results. When Round 1 started, fifteen players experienced tournament action for the first time! By the time round 3 rolled around, the Tournament Director and School Physical Education Teacher, Jeff Risher, had 70 players from the Novice and Intermediate sections doing Jumping Jacks before the round began. The exercise helped the players to get out some tournament jitters, and wake up those brain cells. Although the final results were important to the players, one player in particular demonstrated great sportsmanship behavior at the start of the tournament. Leo Deng from Forest Park Elementary did exactly that. With both the Advanced and Open sections playing with an odd number of players, Risher turned to the top player in the advanced section, Leo Deng, and asked if he would be willing to play up a division. Leo, without hesitation responded with a great attitude. He ended up taking home a 4th place trophy, the sportsmanship award, and the Tournament MVP award. He made a sacrifice that benefited players in 2 divisions! That is the kind of sportsmanship that is so nice to see in competitions, Congratulations Leo! The rest of the results from the Open 1200+ section were very close. Taking home the 3rd place spot was Austin Nguyen from the school of Science and Technology. Second place was Clemen Deng from West Sylvan Middle School and the Section winner with a perfect 5 for 5 was the freshman from Crescent Valley High, Matt Dalthorp. In the Advanced section 901-1200, Jeffery Sun from Lake Grove Elementary in Lake Oswego pulled off some impressive wins and one draw that may have seemed like an underdog story to some as he was not the highest rated player in the group. But to others that know Jeffery, they know him as being a fierce competitor and mastermind of strategy. He has played in 146 tournament games and always plays with class and respect for his opponents. Keshav Siddhartha from Jacob Wismer Elementary took home the 2nd place prize losing his 1st match but bouncing back and winning all 4 of his final matches. Justin Bagoyo from Cooper Mountain placed third and Thomas Kneeland from Crescent Valley High won his Blitz tiebreaker to finish 4th and a sportsmanship award. In the Intermediate section there were many players competing at the 601-900 level for the first time. With 30 players in this division the title wasn’t going to be claimed easily. Two players that really caught the attention of the fans were Arjun Vijay from Laurel Ridge Middle School and Cody Tanz the hometown kid from Metzger. The two struck the crowd by surprise early, as it was Arjun’s first tournament and a first time for Cody being rated above 600. The two battled their way to the top as they headed to the final round winning all four of their previous matches. This was the match that would decide the section champion. It came down to which player had the better pawn structure. Tanz couldn’t avoid having double-stacked pawns on the “g” and “b” files as it created an attack for Vijay. They were the last match to finish and playing with clocks made it even more suspenseful as many fans watched Arjun Vijay Checkmate the young Cody Tanz of Metzger. Arjun’s victory gave him a sigh of relief as he complemented Cody as being a tough player. There’s no doubt the two will face off against each other in up coming tournaments, look out Arjun! The final results were to be decided by a Blitz Playoff between Elias Erickson of Barnes Elementary & Alexander Pham from Forest Park, who both won their final match, tying Tanz with 4.0 points. Pham’s experience showed as he captured the king of Erickson and Tanz taking 2nd overall. Tanz finished with an honorable 3rd and his old teammate Erickson finished 4th. The others that took home trophies were Michael Decker from Laurel Ridge-7th, Ashwin Datta from Jackson Elementary-6th, and Tommy Eblen from the school of Creative Science-5th. Sportsmanship awards went to Arjun Vijay, Tommy Eblen, and Fillip Cannard-CFT. The Novice Section was broken down into both A & B. 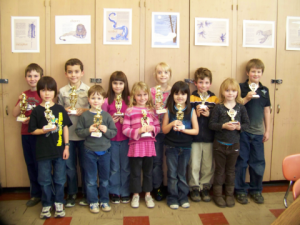 Section A featured U600 in grades K-3 and Section B featured U600 grades 4-6. Zach Smith from Hazeldale Elementary had to win a Blitz Round to claim the 4th place prize. The two teammates from Forest Park, Sahil Salem and Anna Rosenberg battled it out in a Blitz tiebreaker for 2nd and 3rd place. Sahil ended up graciously winning and claiming 2nd along with the sportsmanship award, as young Anna gladly accepted the 3rd place trophy. The big story of this section was 3rd grader Michael O’Neal from Metzger Elementary. Michael had a perfect score of 5/5 defeating the tough Forest Park players to claim his second trophy in only 2 tournaments played. Section B featured another close pairing as unrated Kevin Nguyen trailed his 5th round opponent from Metzger, Hunter Dietz, by only .5 a point. Nguyen attacked early and surprised Dietz with a discovered attack that left Dietz behind early. A checkmate soon followed and the 1st place trophy was his with 4.5 points. In only Hunter’s first tournament of the season the 2nd place prize was surely something he was proud of, winning 4/5. Taking 3rd was another newcomer from Antonia Crater Elementary in Newberg, Zachary Blizard. His only lose came to Dietz in the 3rd round. Forest Park capped off an impressive outing as another player, Randall Zhang earned the 4th place prize. The third round of the Portland Area League was played during the finals week for many of the participating High Schools. We had thought that everyone was going to be able to make the matches and the pairings were made and sent to all the teams for the January 26th match, but that was not the case. Westview had requested a 1/2 point bye but the bye was schedule for the last match for February 23rd instead of January 26th and their coach did not see they were scheduled for a match. Lincoln (the host site for the matches) were barely able to field five players for their top team as their other players must have fled from the school after the finals of that Wednesday to prepare for more finals the next day. The top match of the night saw Lake Oswego #1 getting their revenge on Clackamas #1 by winning on the three middle boards while dropping the top and bottom boards. Sherwood #1 held the very tough Horizon Christian to a drawn match after losing on the first and second boards. LaSalle #1 whip Clackamas #2 by winning the first four boards and taking the last board by forfeit as Clackamas also had a few of their players that needed time to study for their remaining finals. Cleveland came a player short but downed a depleted Lincoln #1 by a score of 3.5 to 1.5. Lake Oswego #2 and LaSalle #2 were even on the first four boards with each of them winning 2 games, however, Lake Oswego brought a full team thereby winning 5th board by forfeit and the match by a score of 3 to 2. Sherwood #2 took no prisoners with a 5 – 0 victory over Wilson. Board 1: Alexandra Botez of Clackamas and Bryce Eng of Jesuit lead with 8 wins over Brian Yang of Access Academy with 7. Board 2: Marcus Woltring of Horizon Christian leads with 9 wins while Dmitri Murphy of Jesuit has 8. Board 3: Tushar Sah of Jesuit is in the lead with an undefeated 9 wins,Jordan Edelson of Lincoln has 7 1/2. Board 4: Charles Earp of Lake Oswego has 9 wins and leads Christopher DiMarrco of Jesuit with 7 1/2. Several Eugene area high school teams comprise the Midwest League — Churchill, Creswell, Junction City, Marist, Pleasant Hill, Sheldon, South Eugene, Springfield, Willamette. Several of the teams are strong and should do well at the OHSCTA championships in March. A contender for the title is Pleasant Hill, who tied for first at last year’s championship (but coming up short on tie breaks). This year’s A team has three returning players (Caleb Kesey, Quinn Stearns, and Jacob Moch), but their newest arrival, Jack Dale, may be the strongest of the lot. Cottage Grove also has a strong team that has been active and performing well for years. The team from South Eugene is mostly inexperienced but surprisingly strong — keep an eye on them at State and in the coming years. Results from rounds 1-6 are now posted at NWSRS. OSCF now has a Picasa Web account for posting photos. Visit the site to view photos of several recent events. If you have photos you’d like to post, contact our photo administrator. You can also find a link on the “Contact Us” menu in the upper left of the home page. Eugene tournament sections used to be primarily grade-based, but this year sections but this year’s Winter Carnival had four ratings-based sections: Novice, Intermediate, Advanced, and Elite Eight. There was a wide age distribution in the three lower sections, but with so many kids having ratings nowadays, there is little danger of terrible mismatches between, say, unknown high school student A vs. unknown primary school student B. Instead, we might have high school student A with a rating of 524 being perfectly safe to match up against 2nd grade student B with a rating of 582. In many tournaments, there are a handful of players whose ratings are quite a bit higher than everyone else’s. If they are all lumped into the same section with much lower-rated players, then they end up playing only a couple of competitive games in a tournament, and the lower-rated don’t feel like they have any chance of winning. 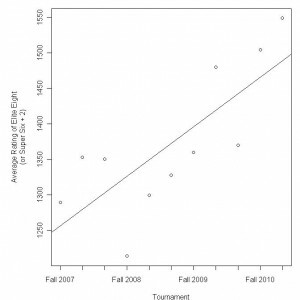 In recent years, the Eugene tournaments have had an Elite Eight (or Super Six) section comprised of the previous winner of the Advanced section and the seven highest-rated players (besides the Advanced qualifier). 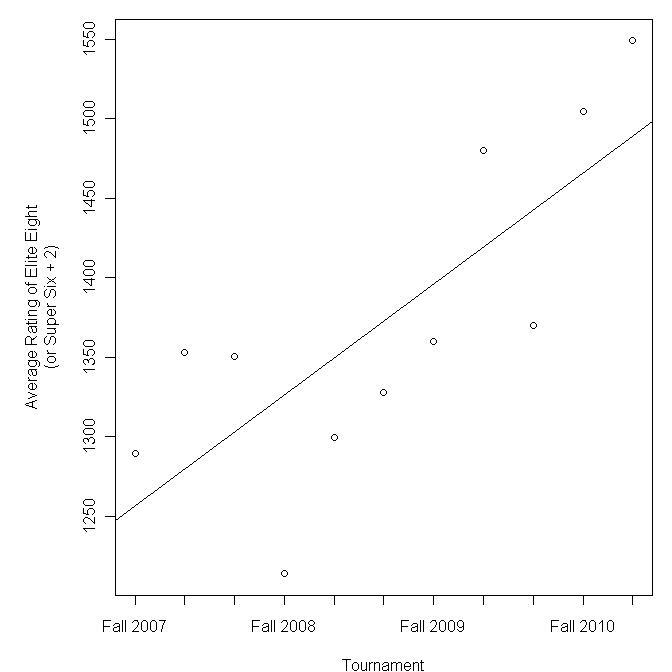 The strength of the Elite Eight has been steadily increasing at an astounding average rate of 23 Elo points per event for the past 11 events. This year’s Winter Carnival was the strongest yet, with an average rating of 1549. Several tournaments over the past couple weeks have now been rated with results posted at NWSRS. 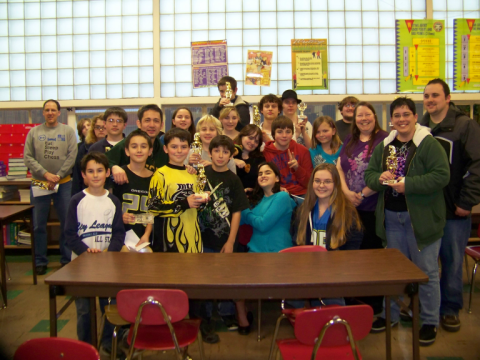 The second annual Chess for FA tournament was a tremendous success! This year’s tournament was attended by a record number of participants from 8 different schools throughout the Portland metro area – from Corbett to Lake Oswego. The tournament raised over $1,000 for the Fanconi Anemia Research Fund. The Fund will use the money to support research to find better treatments – and a cure – for Fanconi anemia, a rare genetic disease. This year’s tournament more than doubled the number of participants, sponsors, in-kind donors, concession sales, participating schools, and funds raised, compared to last year. This was also the first year for the tournament to be NWSRS-rated. The pairing program required for rating was donated by SwissSys. Prizes were donated by Jazzy Bagels and Coldstone Creamery and food & beverages were donated by Wall Street Pizza and Odwalla Juice. 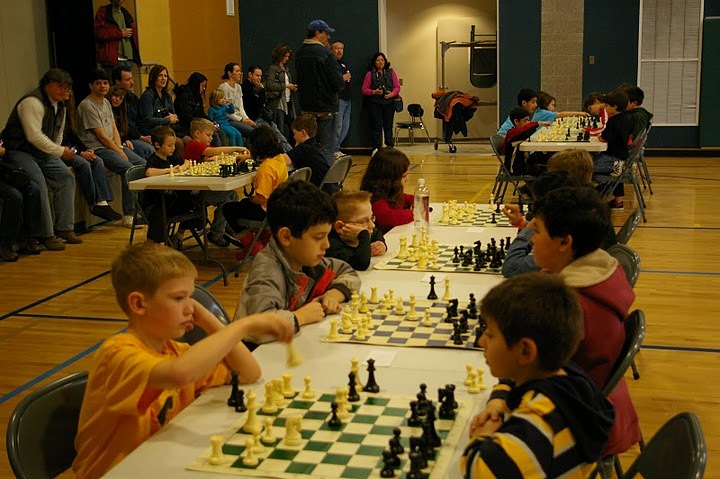 The tournament received great publicity from the Outlook newspaper, Chess for Success, and the Oregon Scholastic Chess Federation. The tournament consisted of four rounds with Swiss system pairings. Participants included two past national champions, including Praveer Sharan, a first-grader from Oak Creek Elementary who won the tournament. The most suspenseful game of the tournament was between Praveer and Suhayl Kodiriy from Parkrose Middle School, the only game to end with time control. In this tense match between skilled players, Paveer won with only six second remaining on his game clock, when Suhayl ran out of time. UPDATE: Games are now rated and results posted at NWSRS (and also at USCF for Power and Mighty Rook Sections — or, in USCF parlance, the “Mighty Roo” section after limiting the name to 10 characters). The power section was open to all players (including adults), and players rated 1300 or higher were required to play in the section. The section attracted fourteen players with a median rating of 1560 and five players rated above 1600, making it one of the strongest scholastic chess tournaments in the state (comparable to the High School Elite Section at the OSCF State Championship). Cash prizes were awarded to the top three finishers: $100-$50-$30, with money being split in case of ties. The three highest-rated players (David Wen, Harry Demarest, and Max Sun — all from Corvallis) all won their first two games. After his first round win, Max started asking about the prize fund. A little premature, perhaps, but in the end it turned out to be a good question as Max ended up tying for 1st. David and Harry had to face each other in the third round. After all the other games were finished, David and Harry still had almost all their pieces on the board with only a few minutes left on the clock for each of them. Neither could see a safe way to break through the long, closed pawn chain, and they agreed to a draw. In the fourth round, Harry met Max. Again. They also played last month at the Corvallis Winter Open. Harry likes the stogid Petroff. Max likes sharp positions and tactical flourishes. In December, he played Cochran’s gambit (1. e4 e5 2. Nf3 Nf6 3. Nxe5 d6 4. Nxf7) against Harry’s Petroff, sacrificing a knight for two pawns in exchange for a wild position. He saw through the mess clearer than Harry did and won the game. In January, deja vu — the story repeats. Max goes into the final round with 4/4, and Harry gets knocked out of contention at 2.5/4. In the meantime, Jack Dale (Cottage Grove), who lost his first game, quietly marched his way up the cross-table, winning games two and three to earn a shot at David Wen, who was sitting in second place. He made the most of his opportunity and chalked up a full point to set up a final round game with Max for first place. Jack won the game to share 1st prize with Max at 4/5. David recovered nicely from his fourth round loss with a victory in the final round to secure third place. Sportsmanship trophies were not awarded in the Power Section, but if they had been, Tom Denison (Corvallis) would have been a likely candidate. Tom (NWSRS 925) is a chess dad who was vastly out-rated by every single player in the section, but he graciously decided to play so that the section would have an even number of players. “Vastly out-rated” by the others, yes, but it turns out that he was also “vastly under-rated.” In the first round, he defeated James Chen (Leslie Middle School, Salem), who was a 435 point ratings favorite. Two rounds later, he knocked off Matt Dalthorp in a 699 point upset. Great work, Tom, and many thanks for playing. In the Mighty Rook Section, Carson Denison (Corvallis) lost his first game but stormed back with four straight wins to finish at 4/5 and sole first place. Not only did he play great chess, but he also won with class and grace, earning the Good Sportsmanship award for the section as well. Carson is a great presence at any chess tournament. Jacob Moch (Pleasant Hill) was another classy guy in the Mighty Rook Section. Whether he wins or loses, Jacob consistently treats his opponents, friends, and TDs with warmth and respect. His classiness was tested in the G/5 blitz playoffs for breaking a three-way tie for 2nd-4th. In his game, he won piece after piece in his first four minutes to get a totally winning position, but in the final minute’s time pressure he lost piece after piece before flagging in the end. Good showing. Fourth place. Torrey Gage-Tomlinson (Pleasant Hill) played a great game in the blitz playoffs, beating John Ornes (Corvallis) to win second place. John is a great player but had to settle for third after confronting Torry Blitz-Maniac. The Best Notation award went to third grader, Leo Sun. There were several candidates for Best Handshake, but the award went to Jackson Christian from Aumsville. Sixteen players competed in the Good Knight “A” Section. Benjamin Kleier (Portland) joined his brother Peter (see “Brave Soul” in the recap of the Power Section) in turning in a great performance, scoring 4.5/5 and winning clean first place. Tied for 2nd-3rd at 4/5 were two players from the Impressive Pleasant Hill High School squad, Kory Schneider and Leo Barrios. (Last year the team tied for first in the high school team state championship, and they might even be a stronger team this year.) Kory won the blitz tiebreak to take 2nd place and relegate his teammate to 3rd. Jeffery Sun (Lake Oswego) finished 4th at 3.5/5. Jeffery is one of the top 3rd graders in the state. Not only does he routinely beat players many years his senior — like 11th grader Leo Barrios in round 2 and 10th grader Sam Robbins in round 4 — he also does an exemplary job recording his games. His score sheets are consistent, complete, and clean, and his good habits will carry him far. 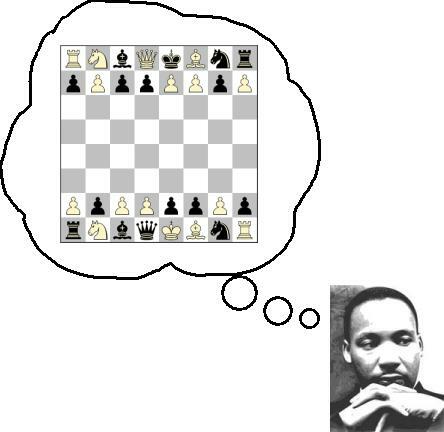 In Corvallis MLK this year, he was so disciplined about his work that he continued his notating into the final round on board 1 against undefeated Benjamin Kleier even though it wasn’t required in his section and Benjamin was not notating the game. And the game turned out well too, as Jeffery ended up being the only player all day that Benjamin was not able to defeat. And, yes, Jeffery won the award for Best Notation in his section. Jeffery also impressed the TD in his room for being particularly polite and helpful to his opponents. Jeffery is another one of those players that TDs and players are delighted to see on the registration list. Several players in the section (Deepraj Pawar, Thomas Kneeland, Lance Roy, Nicholas Kapple) went out of their way to be good sports, reminding their opponents to press the clock after their move. It is not required to do so, but it is a courteous and noble gesture that says, “I don’t want to win the game just because you are not accustomed to using a clock. I have great respect for you and prefer a fair fight over the board.” Taking the prize for Good Sportsmanship in the section, though, was Alexander Eisenhauer for his consistently cheerful demeanor and helpfulness. Xander always seemed alert for opportunities to lift people up. He did fine in the tournament (2/5), but more importantly he impressed people with his good attitude. Second place at 4/5 was Yung-Jung Cheng (Cheldelin MS in Corvallis). This was Yung-Jung’s first tournament, and he is already making a splash and continuing the tradition of Cheldelin as a prolific incubator of chess talent. Third place from home team Zion was Brian Cebra, who just got his established rating last week and now has played his second qualifier this year to qualify for OSCF State in Seaside. Four players tied for 4th-7th — Evan Kooyman (Corvallis), Neal Ornes (Corvallis), James Peterson (Corvallis), and Sean Roberts (Tigard). Evan won the blitz tiebreaks to take home the trophy. Sean impressed the TDs with his great attitude all day long in his first tournament. He dealt gracefully with all the questions and difficulties throughout the day and earned a well-deserved Good Sportsmanship award. The Best Notation award went to Kevin Dai (Hoover Elementary, Corvallis) and the best handshake was James Peterson’s (Zion, Corvallis). Twenty-four players played in the High-Energy “A” section, with Elliot Roberts (Franciscan Montessori, Portland) sitting alone at the top of the standings at the end of the day with 5/5. Tied for 2nd and 3rd were Trevor Thibert (Mountain View, Corvallis) and Fillip Cannard (C.F. Tigard). Trevor won the blitz tiebreak to take home the red 2nd place trophy, leaving 3rd to Fillip. Victoria Liu (Fowler MS, Tigard) and Noah Schuetze (homeschool, Corvallis) tied for 4th and 5th, with Victoria victorious in the blitz tiebreaker. Noah won the Best Notation award for notating every round neatly and carefully and showing his work to the TD. Good Sportsmanship award went to Taylor Rowland (Trent Elementary, Pleasant Hill), and the Best Handshake award was handed to Andrea Durdel. There were twenty-three players in the High-Energy “B” section, which was played in the kindergarten classroom. All the players were 4th grade or younger. Some of the 4th graders may have been nearly too big to sit comfortably in the small chairs, but they were all good sports about it and concentrated on playing great chess. Lane Crabtree (Pleasant Hill) finished at the top of the heap at 4.5/5. A half-point back were three players tying for 2nd-4th: Dante DiCosmo (Zion, Corvallis), Harvey Beleiciks (Grant Elementary, Salem), and Max Franklin (Mountain View, Corvallis). Dante won the blitz playoff to nab the second place trophy, while Harvey got third and Max fourth. Several players made a good impression on the TD for their Good Sportsmanship. Michelle Peterson was polite and respectful toward other players and adult supervisors. When she finished her games, she’d often watch other games in her section, showing them support and respect. Sometimes when young players watch other kids’ games, it is hard for them to understand that hovering over the board or chattering or fidgeting right next to the table can be distracting. Not Michelle. Her antennae are attuned to empathy and was politely careful not to distract or irritate. Lane Crabtree went out of his way to make sure he didn’t get any unfair advantage over his opponents and did not crush their spirits as he crushed them in the game. (Sometimes he may have even taken it a step too far by allowing the occasional takeback or postponing checkmate to let his opponent have a longer game.) Christopher Cannard (C.F. Tigard) was notably patient and polite — positive characteristics that he has developed to a commendable degree as a first grader. In the end, though, the Good Sportsmanship award went to Garrison Christian (Aumsville) for positive attitude throughout the day and for pointing out to his opponent that he was in checkmate when his opponent didn’t see it. It may have cost him a trophy, but he preferred to play it fair rather than try a sneaky trick to continue the game. To pick a winner for the Best Notation award was surprisingly difficult. Usually in a novice, 4th grade and under section, none of the players notate. However, at Corvallis MLK 2011 four players notated: Kai Schlegelmann, Lane Crabtree, Logan Parish, and Harvey Beleiciks. It is not a coincidence that all finished in the top half of the standings, including the section champion (Lane) and one of the players that tied for second (Harvey): players who notate tend to pay more attention to the game and tend to be more careful in their play. Lane, Logan, and Harvey all had complete notation sheets for all five games, and all had wonderfully neat, legible handwriting. In the end, Harvey won the award because his score sheets had so remarkably few errors. It is hard to believe that someone as young as first grade could produce such careful, beautiful notation, but Harvey did it. Best Handshake went to Michelle Peterson.